Having spent the last four days in London, I noticed something interesting about the city’s prominent double-deckers. 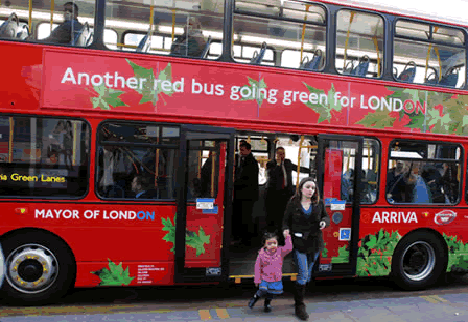 As pictured above, London has been striving to transform their renowned double-deckers into fuel-efficient buses, advertised with the catchy slogan: “Another Red Bus Going Green for London”. Transportation accounts for about 20% of London’s overall carbon emissions and the double-decker buses are popular, especially among tourists. The first hybrid double-decker was introduced into London’s system in 2007. Since then, approximately 800 hybrid buses roam the streets of London, and the city is striving to double this number by the end of 2016. What exactly is a “hybrid” bus? Hybrid buses use a combination of diesel engines and electric battery packs, emitting approximately 40% less carbon dioxide than traditional buses. Energy generated from use of the breaks is used to charge the battery of a hybrid vehicle. Notably, in traditional buses, energy from breaking is wasted. And London’s green bus fleet is ever-improving. This past August, Transport for London (the British agency responsible for public transportation in London), initiated a trial of special hybrid buses capable of wirelessly charging their batteries at bus stops. Similar to Tesla’s “Super Charger” stations, this wireless charging capability allows the vehicles to operate in pure electric mode (i.e. without relying on an engine) for significant lengths of time. This equates to lower costs, less environmental damage, and noise reduction. For context, in 2012/2013 there were approximately 2.3 billion passenger journeys on London buses. 96% of London homes are within 400 meters of a bus service, and interestingly enough, London’s network carries more bus passengers than Paris and New York combined! Interestingly, Transport for London has been widely successful while the deregulation of buses outside London has largely failed. Outside of London, the volume of passenger journeys have decreased, prices have risen faster than inflation, and examples of successful bus markets are scarce. Major Boris Johnson announced earlier this year a plan that would require all new taxis presented for licensing in London to be zero emission capable, commencing on January 1, 2018. This initiative goes hand-in-hand with the Mayor’s desire to transform central London into the world’s first “Ultra Low Emission Zone” by 2020. This transformation involves a commendable goal of a 20% reduction in overall emissions by 2020. London’s efforts are admirable – seemingly, if other cities followed suit, the current climate crisis could be largely ameliorated. Good news from London–a city that is doing some great green things (they pioneered Congestion Pricing awhile back and that’s helped to reduce carbon emissions significantly). Many other cities are taking leading roles in reducing carbon emissions, both from transportation and from operating buildings. 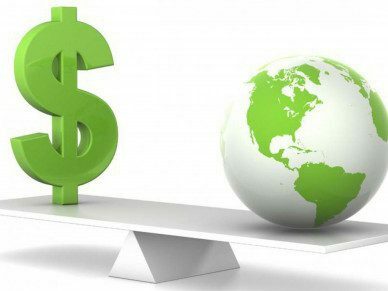 C40.org is a consortium of the leading mega-cities in the world that are committed to “addressing climate change.” London is a member, as is New York. The group started out with 40 cities (hence the name); now they’re up to 64. They do great work; check ’em out. London should be commended. As GreenSportsBlog mentioned, London has both Low Emission Zones 24 hours a day and Congestion Zones during peak periods. In both cases, there is a toll or tax for driving a high-emissions vehicle or driving during peak periods in the City of London. I know you have some London – based readers, so I will let them tell us whether the policies have been effective. Both seem very innovative. Tokyo and Berlin have low emission zones. Many major European cities. The lack of awareness in the United States and denial of global warming is appalling. What about Uber? Have they made any strides to become more green or are they too new? I would assume not but maybe that’s a way taxis can fend off the competition and bring back some lost customers. Would be interested to hear more, good post. Tim – thanks for reading & commenting! You raise an interesting notion. I think Uber has a long way to go before being considered “sustainable”. Because Uber drivers are using their own cars to transport passengers, in order to truly embrace sustainability, Uber would have to mandate all their drivers buy and use fuel-efficient cars. This would limit the universe of potential hirees. And as Uber gains popularity, it will need more drivers. Until Uber has more drivers than needed for passengers, I don’t foresee the company restricting employees based on the type of car they drive. I am only guessing here. What do you think?